WORLD BEATLES DAY IS TODAY. ALL YOU NEED IS LOVE. 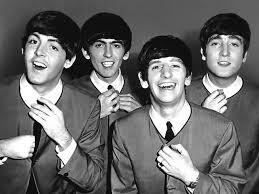 TODAY IS WORLD BEATLES DAY. COME CELEBRATE THE FAB FOUR. James Corden has taken all kinds of musicians out for a ride on his “Late, Late Show” Carpool Karaoke segment. But not have been quite as magical, mystical — or emotional — as Thursday’s drive … with former Beatle Paul McCartney. “I wrote my first song when I was 14,” said McCartney. “It was called, ‘I Lost My Little Girl. '” Then he even crooned a bit of it! And when they actually stopped by the real Penny Lane, they got out so McCartney could add his autograph to one of the signs, and took selfies. Along the way they stopped off in a barbershop (with a barber showing photographs) and met some of the locals on the street. “The last time I was around here, nobody was noticing me at all,” McCartney noted. 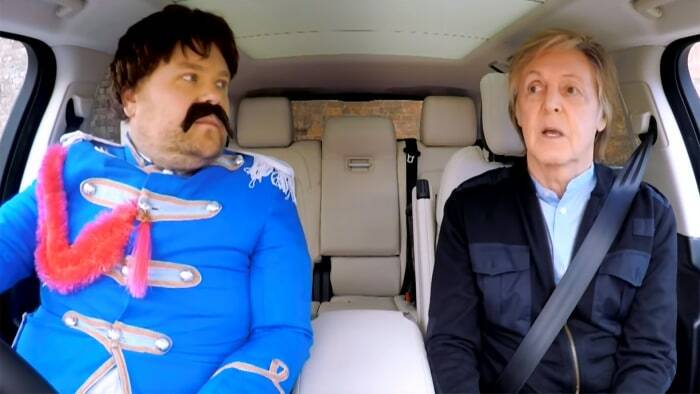 But it wasn’t just about the music; McCartney is loaded with amazing personal and Beatles history that clearly delighted Corden (who wasn’t afraid to poke a little fun by dressing up in Beatles outfits, from the mop-top hairstyle to “Sgt. Pepper’s Lonely Hearts Club Band” colorful military garb). The Late Late Show with James Corden/YouTubeMeet the newest member of Sgt. Pepper’s Lonely Hearts Club Band, James Corden. The pair sang the tune, which left Corden in tears. He noted that his grandfather and his father who played that song for him, and wiped his eyes. Since they were in Liverpool, McCartney and Corden stopped by the house where the songwriter had lived as a teenager and where he and John Lennon wrote several hit songs. The house is now a member of the UK National Trust and has been preserved as it was back in the day. 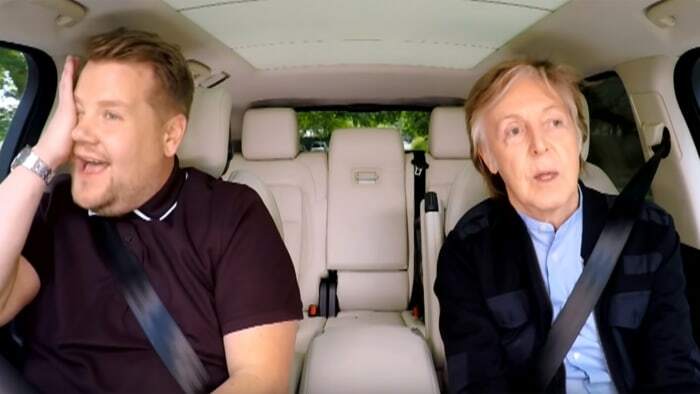 After wandering around the house and noting how the commonplace nature of it inspired his future songs, McCartney invited Corden to the “acoustic chamber,” aka the bathroom. “I would spend hours in here with my guitar,” said McCartney, taking a seat on the toilet. 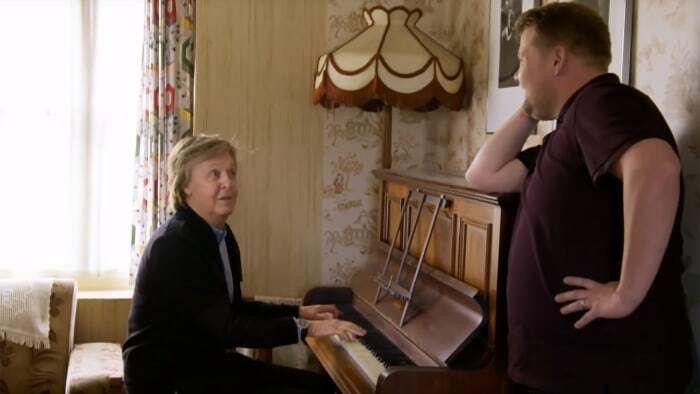 The Late Late Show with James Corden/YouTubeMcCartney takes on “When I’m 64” on his childhood home’s piano. Then he took a seat at the piano and sang, “When I’m 64” while fans gathered outside and took photos. One local said his brother was named after McCartney. 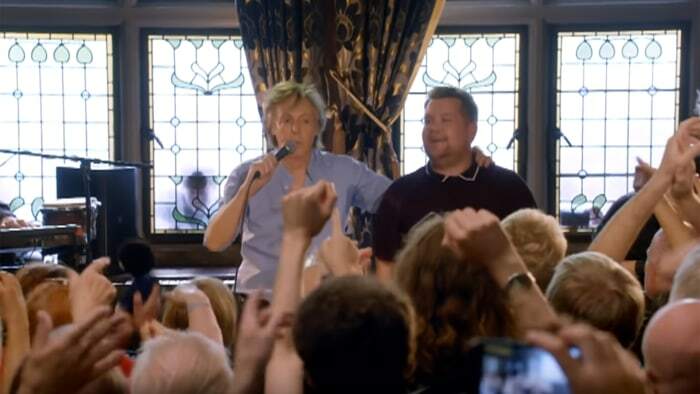 The Late Late Show with James Corden/YouTubeMcCartney and Corden rounded the day out with a pub gig. Of course, no McCartney concert would be complete without a rendition of “Hey Jude,” and for that he invited Corden to join him. Then it was time for tears and emotional hand waving from the audience as they all sang together on that final, repeating chorus. It is nice to know that about him, isn’t it. It is. Shows him in a very different light. Thanks for the lovely summary of a truly marvelous video. I watched it for the first time yesterday and was moved enough to share it on Facebook, as I know so many have. How fun to have a special day focused on the Fab Four. I shall henceforth hum their music all day today. You couldn’t ask for a better ear worm, right? Thanks for stopping by and commenting. The husband and I grinned and drizzled in unison it was wonderful. He could have been like Eric Clapton … who is “celebrity” as in to big to come down to grass roots. Instead he agreed to so much and touched the hearts of so many. The video did make him even more lovable. Paul was always my favorite! Such a crush I had! They were wonderful fellows to have crushes on. Wouldn’t that have been loverly? What a beautiful post. And that was truly one of the best songs. It inspires me to write something about world love. If I brightened it, I am so very pleased. It is hard to post anything bright and happy these days. I too love this video. It is amazing how much joy Paul has brought to folks over the years. When you look at the faces of the people in the pub, you can see he is still bringing joy. I had a huge crush on Paul as a teenager and ended up marrying an English guy called, Paul!! Thanks for stopping by and commenting. The video was so much fun and filled with such love. This is one of the best videos I’ve seen. I was a total Beatles fan, especially Paul. Being 14 in 1964, I loved their music from the early years to the end. Lucky me. You did a beautiful thing by posting this. Thank you, Bernadette! I was 14 in 1964 also and remember the excitement. Thanks for reading. And usually they were fun and good memories. I so enjoy listening to some of the songs and the happiness rushing in. James Cordon has the sweetness and talent to really touch people. I often watch him, and was lucky enough to catch this clip. I’m sure I know every Beatles song word for word! A great playbook to commit to memory. I know I have been here already but I popped to the salon and … well couldn’t resist a second peek. Bernadette, I wanted to let you know I mention you and this post on my latest post. Thank you so much. I read your post and enjoyed the poetic take off on the song.